I’m finally getting around to posting on my bias-cut binding technique. We’ve been very busy around here, finishing up on the new book and 4 patterns that I’m trying to have ready for market. I thought I had everything for the books figured out. Tuesday night I just decided that a couple of the designs just weren’t right and I started over. I’ve already finished and quilted 3 quilts for one of the designs, along with writing all the instructions. So, I’m starting over completely and that’s putting me behind. I was hoping to be shooting photos today, but that will have to wait. I have ended up feeling further behind, instead of finishing up. Such is life as a pattern designer. I told Joel I feel like a tax accountant that has two tax seasons per year (spring and fall market being my April 15th tax quilt deadlines). Anyways, I feel much better about the new designs and can’t wait to show you. In the meantime, I have to share one of my favorite quilting techniques with you – my technique for cutting bias binding. I know so many people are scared of trying bias-cut binding, but it’s so much easier than it sounds. With this method, you can literally cut binding for a queen size quilt in 1o minutes. It’s that quick! For those of you who have tried the tube method – that’s so much harder and takes much longer. This is definitely the way to go. You can click on the link below and print out my instructions. Stash the printout in your quilting folder and refer back to it whenever you want to add bias-cut binding to your quilt. If you were to look through my quilts, about 95% of them would have bias cut binding. Why? -Cutting plaids and strips on the bias is just such an interesting way to finish up the quilt. There are other reasons too – You need to cut binding on the bias if you are going around curves. Another reason to cut binding on the bias, is for extra durability. Cross-cut binding ends up with one or two threads on the edge that take all the wear-n-tear. Bias binding has many threads wrapping around that outside edge and this helps it wear better. 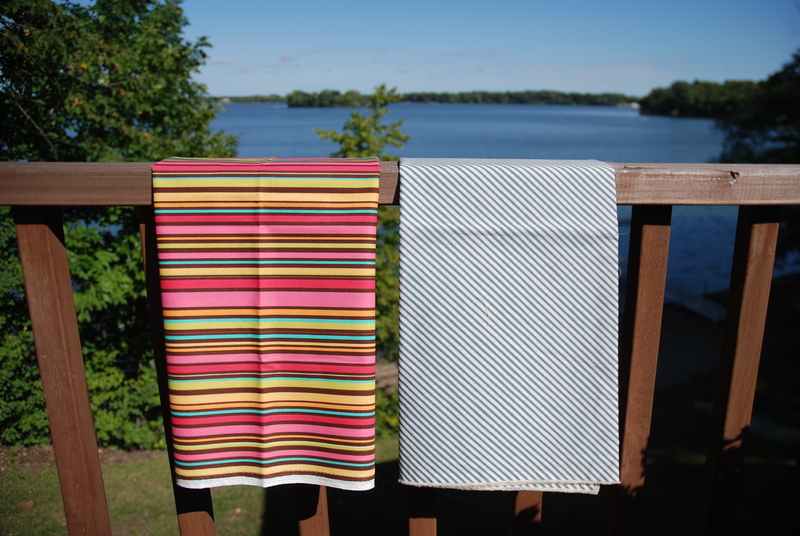 One other thing about stripes and plaids – not all stripes and plaids need to be cut on the bias. The following picture shows two stripes. I would cut the one on the left on the bias. The one on the right is printed on the bias and doesn’t need to be cut on the bias to achieve the look I’m after. Check out this great print – It’s from Heather Bailey’s new line – Pop Garden. It’s a great twist on a stripe – don’t ya think? This is another one that doesn’t need to be cut on the bias. This is the quilt I’m adding it to. As you can see, sometimes I move my sewing machine out onto the deck while I’m working. Here’s a close up of how that stripe cuts up. I just love it! These fabrics are available from Mary at Quilted Treasures and Kimberly at Fat Quarter Shop. Check them out – they are beautiful! 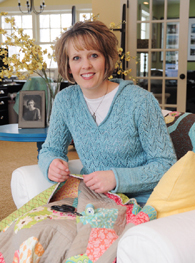 This entry was posted in Binding Tips, Quilting. Bookmark the permalink. I love that quilt! 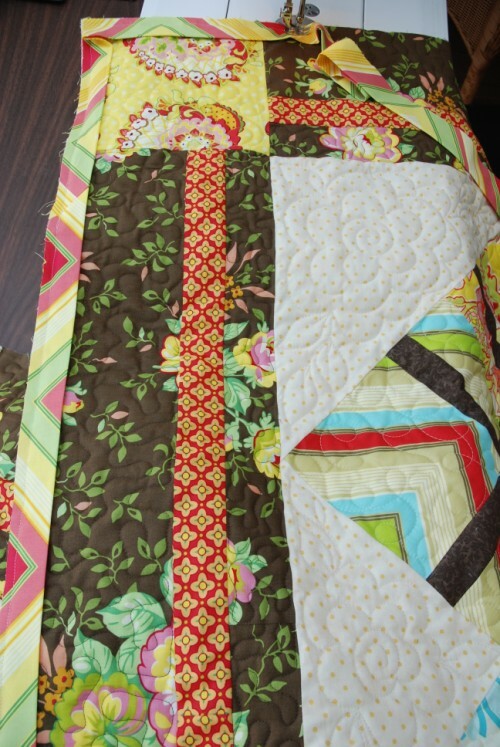 Do you mind sharing the name of the pattern and the quilting design (or who quilted it)? You did a fantastic job. And thanks for the binding handout! I’ve never thought of taking my machine outside, what a great idea. Your quilt is divine. 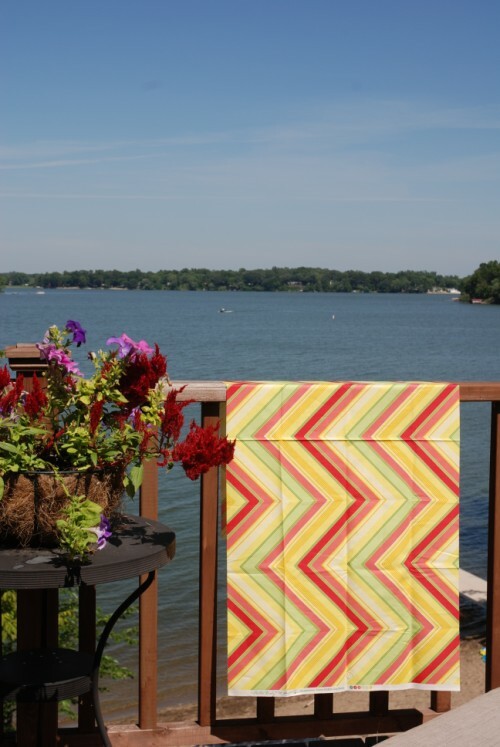 Love that quilt….can you tell us what pattern you used? 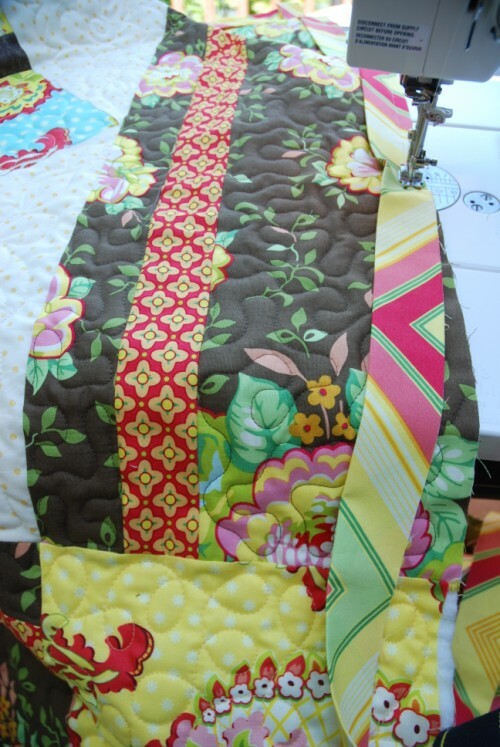 The quilting is cute……. The quilt is beautiful and I love the binding. What a lovely view you have to sew! I’m envious. Thank You so much! I have already printed it (3 times) and will go at it first thing in the morning. You are wonderful, I’ve been watching for this, so thanks so much. I love your pictures and what great binding. It reminds me of an Anna Maria Horner blog from this week. She designed this http://www.flickr.com/photos/annamariahorner/2632337641/in/set-72157606766787015/ to be cut on the bias and used it to bind a doll quilt here, http://annamariahorner.blogspot.com/2008/09/for-deer-girl.html It’s beautiful! Thanks for the ideas. Your blog is at the TOP of my list of must checks. Every time I go away from your blog I am inspired!!! I have already made 3 of your quilts and I plan to make many more!! Of all the quilting blogs I lurk in yours is by far the most helpful and inspirational. It’s like opening up a mini quilting magazine. I’ve already copied off the binding tips you’ve given and posted them near my sewing machine so I can use them on my next quilt. I live in Korea and cannot go to quilts stores, so when I visit your blog it’s like taking a trip to the local quilt store—beautiful quilts as eye candy and little tips to help as I quilt at home! Being an Iowa girl, the views out your window remind me of the beauty that I miss in the midwest!!! THANK YOU, THANK YOU!!! Please don’t tell me you actually get to sew overlooking all of that! I am jealous enough of your sewing room (okay, sewing wing). Your quilting is seriously amazing. Those flowers? Nice. I’m really anxious to try your bias strip cutting method! I have to admit I love stripes on a binding, but hate the bias method. Thanks so much for posting this. . . I never liked the tube version of cutting bias binding. . . & this one is so easy! I’m saving the tutorial for all my future bias bindings! Love the lake view! . . You make me miss Minnesota! I love the quilt in your blog header and was wondering if you could tell me what the name is of the brown floral border fabric. I have tried searching for it online, but haven’t had any luck. Thanks for the binding tutorial. I’ll definitely be using your technique in the future. I was waiting for your bias binding tips, so thanks so very much for posting the handout. I can’t believe that you started completely over on some of your designs…but it’s nice to know that even you, have design issues. I can hardly wait to see what you have in store for market. At least two of us are not able to download or even read the binding tips. Anyone else have problems with that? Did you ever get a answer about not being able to read/see the binding tips? I have a Mac, and cannot see any photos that were on the tutorial. Would love to know how to do it. Follow-up to A. Betty comment – I can’t get the graphics to download and few of the words. I’m excited to learn the technique. Thanks. I can hardly wait to start cutting. I could never understand the tube technique. This is just so simple. I just saw you and your wonderful quilts at “Women of the West” quilt group in Medina. I have just finished looking at all the info on your blog. What wonderful pictures and information on quilting hints. The biggest hint is the bias cutting. What a time saver! Also the binding tec. is a real time saver too. I use to spend a hour trying to finish a quilt and get the 45 angle finish on the binding. Now I can finish a project without breaking a sweat and have it look great every time. thanks for a very interesting web site. I will have to try that bias techique. It is printed for future reference. Thank you so much for this technique – I really liked the valance and never thought of putting a flowered fabric with a strips binding but it certainly turned out well. I can’t say Thank You enough- I’m about to use this method for the second time- what a huge timesaver! I’ve always hated that stupid tube!!! 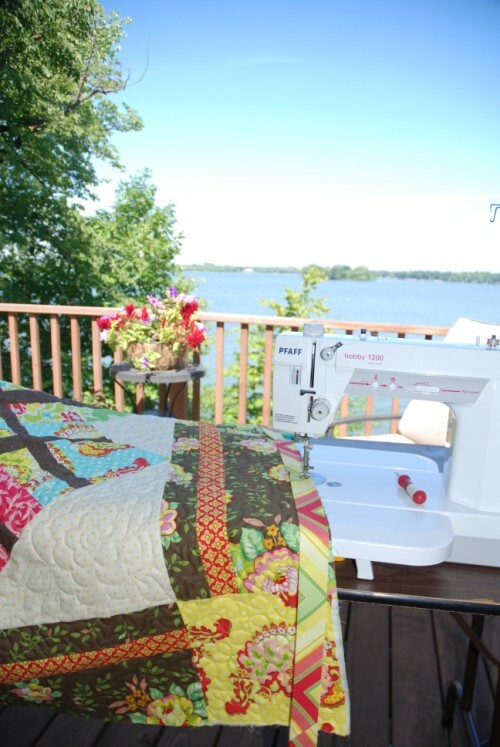 Heather–I made the scappin sixties quilt and LOVE IT! I’m getting ready to bind and I can’t get the graphics of your cutting instructions to show up on my mac…… any suggestions? Please email me as I probably won’t check back here–thanks! 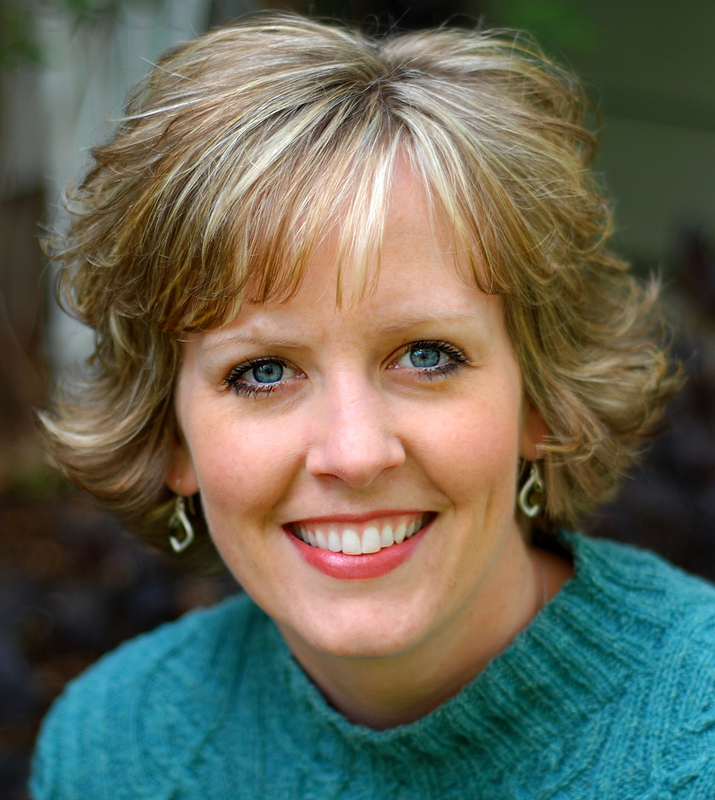 Wow – I’ve never come across this method before! I printed off the directions so I’m ready the next time I need a bias binding. Thanks so much!! Thanks for the bias binding tip. It worked great for my tree skirt. If I had a deck that looked out on that gorgeous view, I’d spend as much time as possible out there! May I have your permission to print this tutorial for use with teaching young girls in sewing classes? You have clearly laid out a great way to make easy bias strips. Thank you. I just tried your method and it’s so easy! Thanks so much. I have printed your handout and saved the link. Thanks, thanks, thanks! “Quick and Easy Bias Cut Binding Tip | Trends and Traditions” was indeed a delightful article, can’t wait to look over even more of ur articles. This is a great method for Bias Cutting! Thanks so much for sharing!